This, the latest production in my series of previously unpublished or extremely rare memoirs of the Napoleonic Wars is a nice little journal by First Lieutenant Thomas Edwardes-Tucker of the 23rd (Welch Fusiliers) Regiment of Foot. It is very strange that such a famous regiment has only one partial memoir of its service in the Peninsular; that of Captain Thomas Browne, covering the end of 1810 to 1812, when he went on the Staff. Thomas was the son of John Owen Edwardes who had assumed the additional surname of Tucker of Sealyham as his wife was joint heiress to the family estate. Tucker joined the 23rd as a 2nd Lieutenant on 16 July 1807 from the 15th Foot and became a First Lieutenant on 22 September 1808. He served with the 2nd Battalion during Moore’s campaign in Spain and participated in the terrible retreat to Corunna. Transferring to the 1st Battalion he then served in Spain from December 1811, being present at the sieges of both Ciudad Rodrigo and Badajoz. At the latter he was severely wounded in the hip and jaw and returned home in May 1812 to recuperate; he was awarded two pensions of £100 per annum (£3,400 p.a. each in modern terms) as a pension for these wound. He was given the sobriquet of ‘Battered Jaws’ after this. Having recovered, he was not destined to return to the regiment; his family being practically neighbours of Sir Thomas Picton in West Wales, and their influence on the local voters would seem the most likely reason for him to suddenly be offered the position of aide de camp to General Picton, which he accepted and served throughout the remainder of the war in Spain and Southern France in this role. In 1848 when the Military General Service Medal was inaugurated, (retrospectively awarded to surviving veterans of actions from 1800); Tucker received a medal with bars for Corunna, Ciudad Rodrigo, Badajoz, Vitoria, Pyrenees, Orthes & Toulouse. 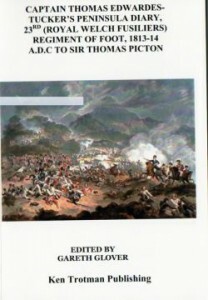 Presumably Thomas wrote a journal throughout the war, but unfortunately only the one he wrote as aide de camp to Sir Thomas Picton has been found. it is hoped that the publication of this journal may unearth the hiding place of his other diaries, if they still exist. With the end of the war in 1814, he returned home much troubled by his wounds and having gained a captaincy in the 44th Foot on 16 March 1815, he went on half pay. Tucker did not follow Picton to Waterloo and therefore was not with him at his gallant death. Tucker found his hip wound so troublesome as to be forced to use a wheelchair for the majority of his life. He married Emma Middleton and had children and was living in Omagh when his aunt left him her estate in 1835. He however died on the island of Jersey in 1853.